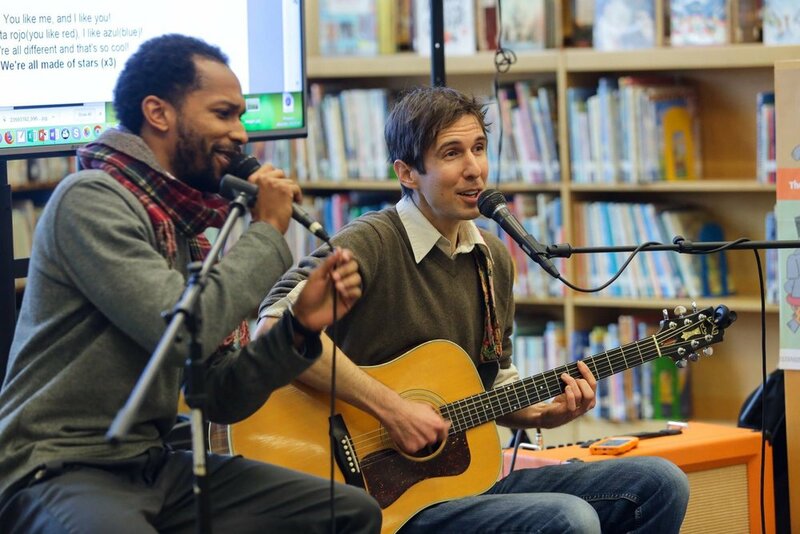 I am delighted to announce that City Love, a musical duo consisting of me and Dwight Dunston, has recently released an album of children's music about diversity, equity, and inclusion called, The Future Is Bright. Our duo has shared workshops and assemblies at schools, colleges and conferences throughout the country for the last five years, and we are currently the Friends in Residence at Haverford College. Research shows us that prejudice forms very early on (before age 3!) but that we can interrupt that prejudice when we talk in our homes and classrooms about our differences, about fairness, about caring, and sharing with all people. Our new album seeks to give families, teachers, and children shared language, narratives, and theme songs to do just that. Our album also contains collaborations with experts in the field: Dr. Ali Michael, co-founding Director of the Race Institute for K-12 Educators; Dr. Howard Stevenson, the Constance Clayton Professor of Urban Education at the University of Pennsylvania and Executive Director of the Racial Empowerment Collaborative (REC); and Dr. Peggy McIntosh, founder of the National Seeking Educational Equity & Diversity (SEED) Project on Inclusive Curriculum and Senior Research Associate of the Wellesley Centers for Women. The Future Is Bright is a distillation of the diversity work The Philadelphia School has engaged in over the years, inspiration from TPS Kindergarten faculty/students, and a developmentally appropriate translation of City Love’s years of facilitating workshops on racial justice for older audiences with their music. We hope this album can be a road map to a more loving, just world for the next generation, as well as a musical vaccination against hatred and bigotry. Fifty percent of album sales will go toward organizations working on equitable access to education, children’s advocacy, and anti-racist education. Dwight and I hope this music and its impact will make The Philadelphia School community feel proud.